Fatah leadership formulates plan for unity gov't with Hamas over all areas under Palestinian Authority control. Hamas, however, has not yet agreed. The leadership of Fatah has formulated a plan for a unity government with Hamas over all the areas under Palestinian Authority control – Gaza, Judea and Samaria. Hamas, however, has not yet agreed. The plan, reported by the PA’s Ma'an news agency, was formulated by PA prime minister Salam Fayyad, and was approved by PA Chairman Abu Mazen (Mahmoud Abbas). 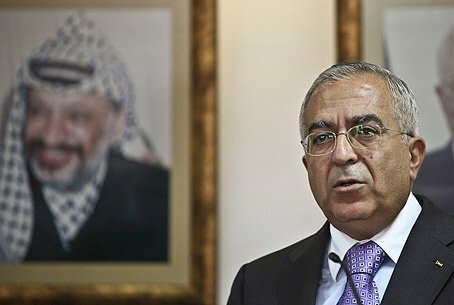 It calls for a unity government, headed by Fayyad, that will run affairs in the different areas via the already existing institutions of both Fatah and Hamas. Correspondent Haggai Huberman quotes Fatah officials as saying that as a goodwill gesture towards Hamas for agreeing to resolve the split between the two, it will allow the Hamas security forces to continue to operate in Gaza. The officials said Hamas must also agree to continue its "ceasefire" with Israel (a unique kind of "ceasefire" that involves regular missile strikes on Israeli citizens). Fatah and Hamas fought a short but bloody war in May-June of 2007, in which 170 were killed. Both groups killed opponents by throwing them from building tops. The battles left Hamas in control of Gaza, and sporadic clashes have erupted since then as well.